Scientists have effectively turned E. coli (the stuff that can give you a bad case of food poisoning) into a mini hard drive. In a new study in the journal Nature, researchers from Harvard University have managed to encode a short video into the DNA of a living cell. Just like downloading a film from a USB stick, they were then able to retrieve the video from the cell and replay it. Scientists have been able to “upload” data onto DNA before but this is the first time a video has been replayed from the bacteria. The team also recorded a human handprint in a nod to the first cave paintings. To the left is an image of a human hand, which was encoded into nucleotides and captured by the CRISPR-Cas adaptation system in living bacteria. To the right is the image after multiple generations of bacterial growth, recovered by sequencing bacterial genomes. Think of it like this: DNA is essentially just a way of storing information, not dissimilar from digital storage. Instead of coding for data in 1s and 0s like a hard drive, DNA uses four nucleotide bases that code the information instead. “We then provided spacer collections for consecutive frames chronologically to a population of bacteria which, using Cas1/Cas2 activity, added them to the CRISPR arrays in their genomes,” he added. The movie that the researchers selected consisted of five frames adapted from British photographer Eadweard Muybridge’s Human and Animal Locomotion series. The frames of the video are from one of the earliest precursors to motion film, Sallie Gardner at a Gallop. This series of photographs depict a horse galloping, taken in 1878 by British photography pioneer Eadweard Muybridge. When the photos are put together, they create an animation effect. 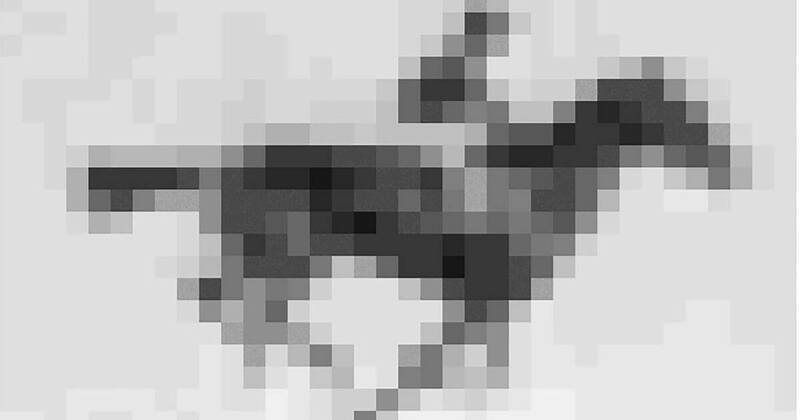 The original photographs have acquired an iconic status in the world of motion film but the original purpose of the photo shoot was simply to find out whether a horse ever lifts all four feet completely off the ground during a gallop. The advance in this study is a proof-of-concept to demonstrate the possibilities of using DNA to store data. It might just sound like a gimmick but considering how much data we are continually pumping out, it could be the key to resolving our data storage woes. DNA is ultra-compact, meaning you could theoretically store all the world’s data in just one room. It also has the ability to be stored for hundreds of thousands of years if it’s kept under the right conditions. Crispr technology precisely changes small parts of genetic code. Unlike other gene-silencing tools, the Crispr system targets the genome’s source material and permanently turns off genes at the DNA level. The DNA cut – known as a double strand break – closely mimics the kinds of mutations that occur naturally, for instance after chronic sun exposure. But unlike UV rays that can result in genetic alterations, the Crispr system causes a mutation at a precise location in the genome. When cellular machinery repairs the DNA break, it removes a small snip of DNA. In this way, researchers can precisely turn off specific genes in the genome. But other than Cas9, now famous as a widely used genome-engineering tool, other parts of the CRISPR system so far have not been much exploited. ‘We designed strategies that essentially translate the digital information contained in each pixel of an image or frame as well as the frame number into a DNA code, that, with additional sequences, is incorporated into spacers. ‘Each frame thus becomes a collection of spacers,’ Shipman said. ‘One day, we may be able to follow all the developmental decisions that a differentiating neuron is taking from an early stem cell to a highly-specialized type of cell in the brain, leading to a better understanding of how basic biological and developmental processes are choreographed,’ said Shipman.